The beautiful 22k Gold layered lava pipe is the flagship of the Celebration Pipes line. Celebration Pipes are "NO KA OI"... the very best from Hawaii. 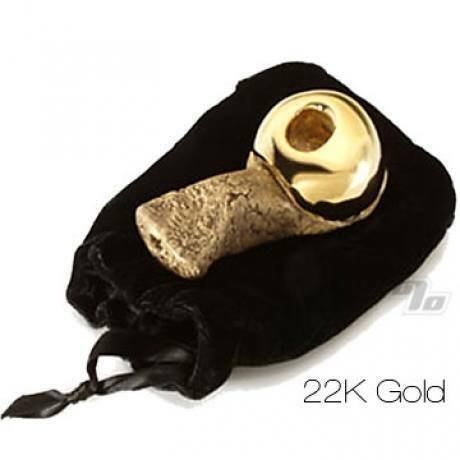 Each pipe is handcrafted, signed, fired to over 2,350 degrees Fahrenheit and then plated in 22k gold. The gold bowls reflect heat and completely burn whatever is inside of them; more "bang for the buck". The base is made from Lavastoneware, a unique compound hi tech in its heat abating simplicity. So ive always wanted one of these and i finally ordered it, what a cool pipe. Theres no carb and you must use a screen but this thing is definitely something to celebrate with. Thanks everyone at 1% for your great stuff glad you guys are still around. I purchased this as a wedding present for a couple, they loved them. Nice presentation with the box and hand numbered card. Awsome pipe. Large bowl a plus. This pipe has a hefty feel to it. The bowl is big it is just stunning to look at. Pretty classy pipe but I thought that the overall finish would have been a bit better. The gold did not completely cover the epoxy base on mine. For the price I expected that attention to detail. Whenever I use this unique and beautiful pipe I always have people ask me where I got it. Along with the large bowl and easy grip it is always the one that my friends and family ask to use. One of the most beautiful pieces of art I have ever seen. The bowl is nice and deep. All my friends that have seen and used it so far have loved it. If you're reading this, buy it now. You won't regret it.